Since online threats are only increasing in numbers (and quite fast these days), an extra layer of security is definitely good to have. 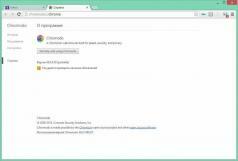 Chromodo is a fast and lightweight Chromium bsed browser that comes with enhanced security tools for safer browsing and a computer protected against online threats. There’s nothing special about Chromodo’s looks (if you’re used to Chrome) – all the basic operations are the same, from typing in URLs and opening new tabs to bookmarking new items and closing individual processed. Unlike the most popular browsers, Chromodo is a security oriented browser. It bundles a variety of extensions that protect users against online malware. You’ll get add-ons such as PrivDog, that stops websites from tracking your activity, as well as Comodo Web Inspector – which analyzes the currently accesed site to find if it’s present on any kind of Internet blacklist. Furthermore, Chromodo comes with social sharing options, allowing you to share your most interesting finds on Facebook, LinkedIn and pretty much any other social network, throuh the related browser extension.